2. Luster's PCJ No-Lye Creme Relaxer for Children- my first relaxer as a child, I loved seeing the PCJ ads in Essence magazine! And out of those here are the leading ones. 1. 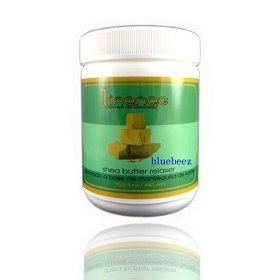 Alter Ego Linange No-Lye Shea Butter Creme Relaxer! You guys know I've been using this relaxer since last spring and I LOVE IT. This relaxer provides my hair with the softness, body, and shine I've always looked for! And it straightens my roots. :D I talk about it all the time.....I'm totally satisfied with this relaxer so I doubt I'll be changing again. 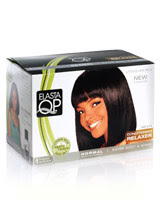 Another great relaxer...Elasta QP left me with beautiful waves. My new growth was straight, but wavy. 4. 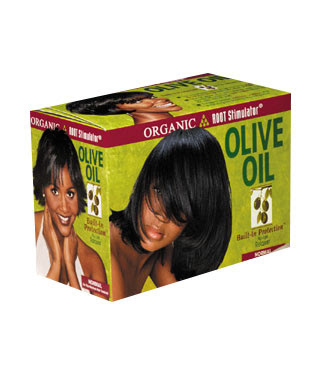 Organic Root Stimulator Olive Oil No-Lye Relaxer This was the second relaxer I used at the beginning of my hair care journey back in 2007. I remember walking around the entire day touching my hair because it was so SOFT. My hair had never been that soft after a relaxer. I really couldn't believe it.... 5. 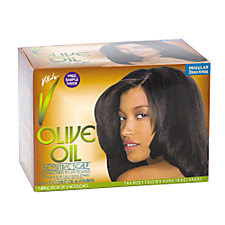 Vitale Olive Oil Sensitive Scalp No-Lye Relaxer Vitale gives you great results as far straightness. My roots were always straight with this relaxer. Honorable Mention: I have heard about how great Phyto Phytospecific Phytorelaxer Index I & II & Avlon Affirm Sensitive Scalp Relaxer are, but I've never tried them because of how expensive they are. My Alter Ego costs me about $15-20 depending on what kind of shipping I get. So the price is definitely right. Have you guys tried any of these relaxers? What's your favorite relaxer? I've used Silk Elements and the results were ok enough for me to use again. I tried Elasta once and it was abit too harsh on my hair. I think I'll give the Alter Ego a try, thanks for the suggestion. To start off, I have coarse hair.I've tried Alter Ego and I strongly dislike it. It made my hair so finely thin (if that makes since) that I was outraged. I had it put in by a professional. Well I wasn't outraged....lol, but I was happy with thinailooking hair. It looked nice, don't get me wrong, but it was just too thin. I've used Affirm for years and I like it. I have no complaints. As far as having bone-straight hair is concerned, I was told that african (black or colored people)people's hair should not be relaxed bone straight. Love what you're doing K.D.! @Ambrosia Let me know how u like the ORS! Has anyone used Precise? What about Epitome? I used it many moons ago, when I self-relaxed. My most recent perm has been Design Essentials time release, but I have two wait 3 weeks before my fine hair reflects volume. I stood in line at sephora with phyto, but grew skeptical and left without the product. Is Alter Ego still your fav? 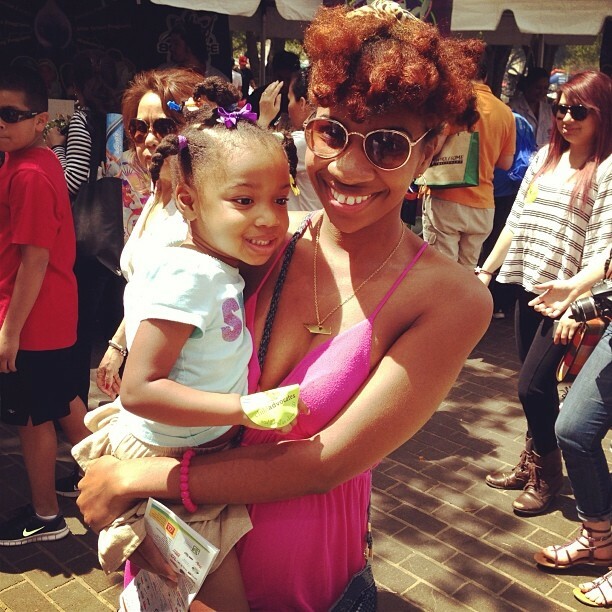 My daughter and I love Organic Root Stimulator's Olive Oil relaxer! It leaves our hair soft, shiny, bouncing & behaving..lol And it goes the distance touch-ups between 7-8 wks. I have had my hair 'natural' for 10 years now and decided to relax it for the new year. I'm looking for a great relaxer to use and would welcome your suggestions. My hair was always fine and thin even when I was a child. It only passed my shoulders when I was pregnant. Looking for a change. HELP! I noticed you don't have the affirm fibrtguard sensitive scalp creme relaxer in your list.But, that is by far the best no lye I haved used. I get it done at salon most of the times due to the messiness involved. Heard very good things about Phyto and Olive Oil relaxers as well. @Anon I've never used either one of those. @FeFe I'm natural now, but yes girl Alter Ego was my absolute fave when I was relaxed! @Anon I'm glad you've found what works for you. :-) That's the most important thing! @Mika Try Alter Ego! That was my fave relaxer when I was relaxed. I had to buy it from here because it wasn't sold at my local bss. Here's the link: http://www.beautyofnewyork.com/shopping/2F9E270109KD1014.htm I always go no-lye. @Nole I've never used Affirm, but I've always heard great things about them! I also used to hear about Phyto, but I didn't try them out when I relaxed. Glad you like Affirm! but I've never tried them because of how expensive they are. The reason for Avalon Affirm being more expensive is most likely them only being sold in professional packages with a minimum of 4 applications. Meaning u can relax your hair 4 times etc, it goes all the way up to 20 application packages in which case u would get em for half the original price. Yes its good to use organic root.it is better than all. I've used the Phyto relaxer (Index II) 3 times. It is VERY GOOD. Pros: Gentle on the scalp (e.g. doesn't burn if you need more smoothing time), straightens hair very well, hair is soft not hard after application. 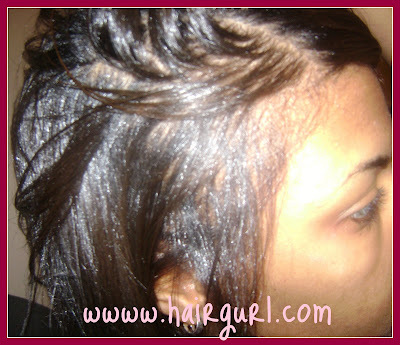 I applied the relaxer myself the 1st time I tried it; I barely had enough to cover my head. The other 2x, I bought it and had my beautician apply it. She was able to stretch the relaxer contents a little further, but not by much. All 3x, I was very happy with results. Phyto is worth it if you a) like the hair straight, b) don't want any scalp burns & c) soft not hard hair after relaxing. However, because of the price & small amount of relaxer provided with the kit, this is best applied by someone else. I have to give it to Organics Root Stimulator Olive Oil Relaxer range, I have nothing but praises for it. 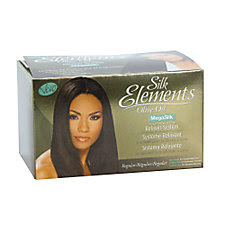 It leaves my hair super-straight for longer compared to other relaxers and my hair is so soft! I've seen some growth since I've been using it, my scalp is much healthier and I've noticed it too with some family members to whom I've recommended it to. Its good to stick to one brand, don't change your brands. straighten or blow dry your hair. Can someone please post any info on epitomi shae butter relaxer? I have used affirm,it's great, through lack of availability I tried PCJ kids, it left my hair dry and damaged. Motions is horrible that's probably why you have bald spots. That thing will burn a hole in your head. Are the top 5 in order or just listed? i have really strong and thick curls, which one would u recommend me? (i dont want to buy the alter ego one bc its not a kit and ill have to buy the rest separate) i couldn't choose between nr 2 and 4, which one would u recommend? Try not to relax your child's hair let it be her own decision when she grows out. Natural hair is beautiful you can wash it with organ shampoo conditioner and moisturiser I use 'I love afro products for my daughter it's a bit of an effort but I do it because I know that most of the relaxers have side effects even though guaranteed 100% but who knows What is exactly in there. Good luck. Same happened to me,was very disappointed. I use motions, however would like to switch. Affirm burns my scalp. I know it's a top relaxer. Would like to try organic stimulator. 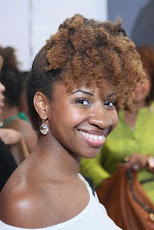 I've enjoyed reading the No Lye Perm comments: excellent!!! My hair is long (mid back) and fine. Albeit long, it gives the illusion of thickness but that's because I have a lot of hair strands. All that to say I'm going short but quite apprehensive about perming my virgin tresses to achieve the NEW look. Would be nice if I could post a selfie and photo of the style I'm considering. I love the texture and feel of my hair but nervous about potentially, "permanently" damaging what took years to achieve. Most decisions are risky I just don't want to be disappointed!!! Plz help. Thanks so much :). Did you figure out what to use? My hair is like yours, fine but a lot of strands (which makes it look thick) and mid back. I don't want something drying or make my hair flat.